Do you have a little one that is learning to read or a child who could use a little reading help? Get your child reading with a FREE 4 week trial of Reading Eggs! Reading Eggs is an award-winning online reading program geared towards children ages 3 to 13 years old. It makes learning to read a fun experience for kids. Reading Eggs is used in over 169 countries around the world and has a 99.6% parental satisfaction rating. Check out this video below for a quick introduction to Reading Eggs. Sign up today for the FREE 4 week trial of Reading Eggs! No credit card required. Hurry because this special offer ends on November 30th! Connect with Reading Eggs on Facebook, Twitter, Pinterest, YouTube and their blog. 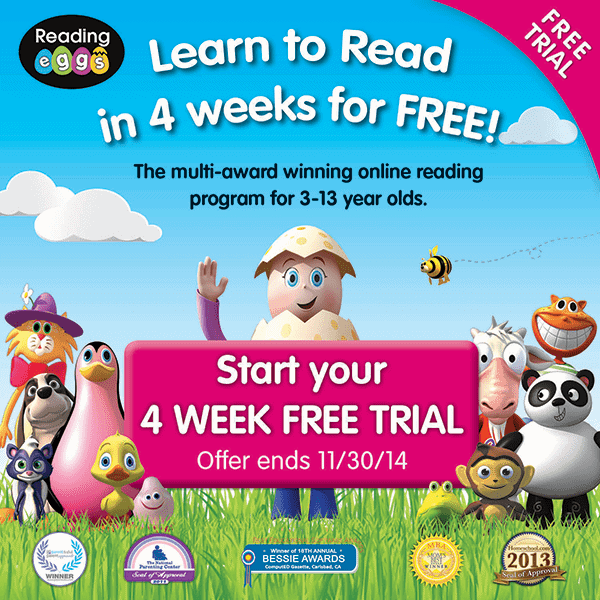 awesome offer of 4 weeks free trial; an asset to anyone learning to read and wanting to improve their reading skills. I don’t have a little reader yet, as my girl is still young, but this is impressive! This is so awesome, my son is learning how to read so I should definitely get this for him!! Thanks for the great idea! This would be a great idea for my four year old daughter. i’ve never heard of this company but i think it’s so nice of them to offer a trial! 2nd try at getting this posted :-(. This is a truely awsome offer. FREE 4 week trial of Reading Eggs, it’s seldom one gets such a super offer. I’m going to pass this on to my son and daughter who have children who have just started school. Thanks for the heads-up. Reading Eggs is AWESOME! A friend recommended Reading Eggs to us a few years ago when my daughter was 4, and we signed up for the free trial back then and it was an awesome program – she went from being a beginner reader starting to sound things out, to an actual reader by the end (I think our length was 3 months though, not 4 weeks, because there was also a Groupon we purchased for some additional time). This is pretty much the only “formal” reading instruction she has had in English (we have read to her a lot since birth, but never tried to teach her to read until this program), and she was reading story books before kindergarten and by grade 1 she was reading chapter books. She is now in grade 2 and reading at a grade 4 level, and she goes to French school so has had zero instruction in reading in English. I definitely recommend giving the program a try – especially with the free trial! My daughter loved it, and it really worked for her! This program sounds awesome! I’m going to suggest it for my young nephew. This looks interesting, thanks for sharing! This is great! I love that they give you 4 weeks to try it. After 4 weeks you would know if it was the right app for your child. This looks like it would be great for my nephew. Thanks! Pretty good satisfaction rate! Had not heard of the program before but looks helpful and fun! I will have to check this out for my granddaughter, this is the first I have heard of this, it sounds like a great program! I’d love to try the free trial and see how my grandson responds. Sounds like a wonderful program!